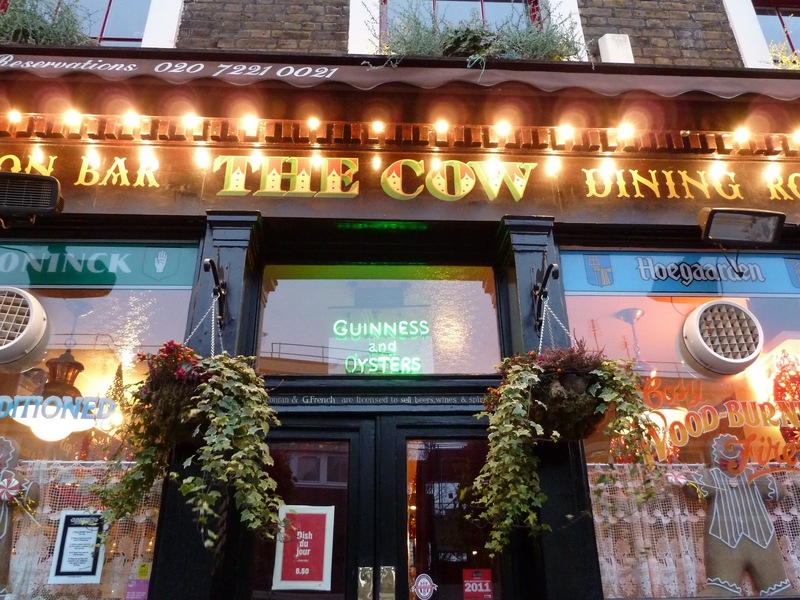 Situated equidistant between Royal Oak and Westbourne Park tube stations The Cow is nice and easy to get to and impossible to miss when you approach. Both interior and exterior are modelled on a Belgian bar and the beer selection reflects this choice of decor with a good selection of wheat beers as well as the usual array of lagers. We opted for two glasses of De Konick lager which given it’s strength (8%) is only served in half pints which cost an alarming £7.40. Given that my reviews are generally about real ale pubs it’s important to note that this isn’t one of those only serving Fullers London Pride and one guest ale on tap. It’s well worth a trip though simply for its novelty value, I’ve never been anywhere quite like it. It panders to the tradition of serving Guinness with oysters which I’m led to believe is an antiquated staple food of the working classes. These days the menu is slightly more diverse and actually quite impressive. An odd side effect of the prominence of Guinness branding in the pub is that lends it a slightly Irish vibe which is helped by the fact that ‘Taytos’ (arguably the best crisps in the world) are on offer in three different flavours behind the bar. On the whole the atmosphere was excellent if a little on the bohemian side rather than being a traditional pub ‘man pub’. Other items of note about the pub that I felt at the time it was important to write down…. There are lovely art deco urinals. The bar staff were very happy to lend me a pen. If you flick the glasses that the Belgian draft beer is served in they make a pleasant sound.